Download "Deposit Plan. 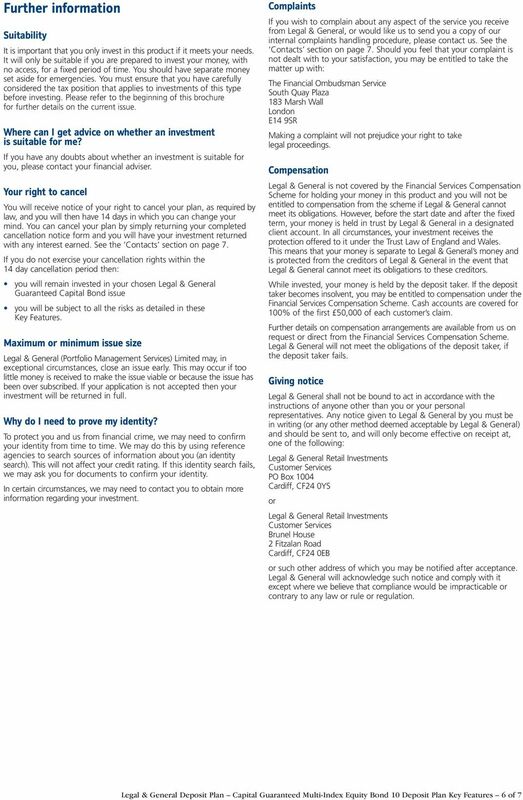 Legal & General (Portfolio Management Services) Limited. 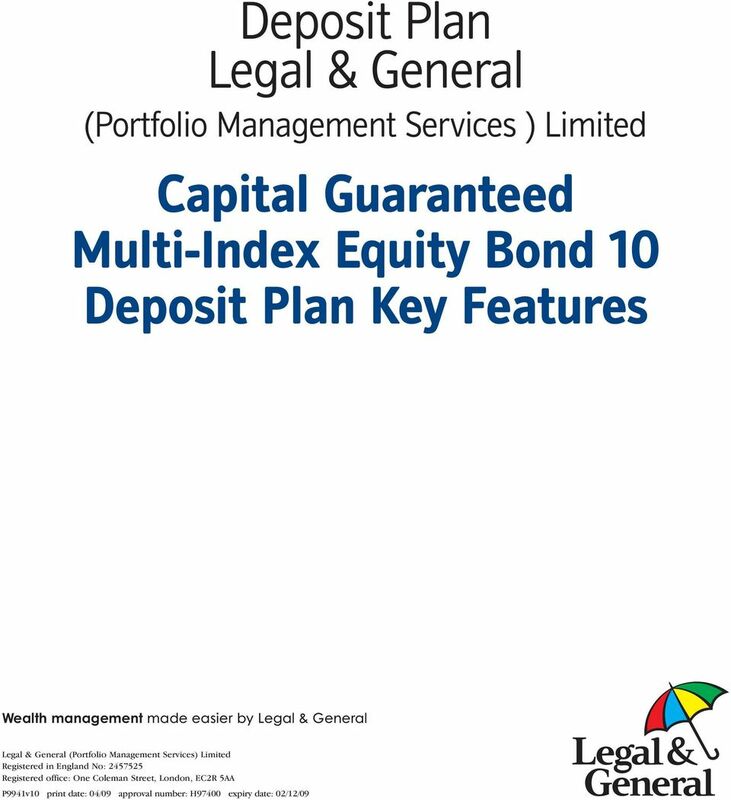 Capital Guaranteed Multi-Index Equity Bond 10 Deposit Plan Key Features"
The UK Fixed Income Plan 1 A five year fixed term investment providing a fixed income of either 6.25% once a year or 0.50% monthly. 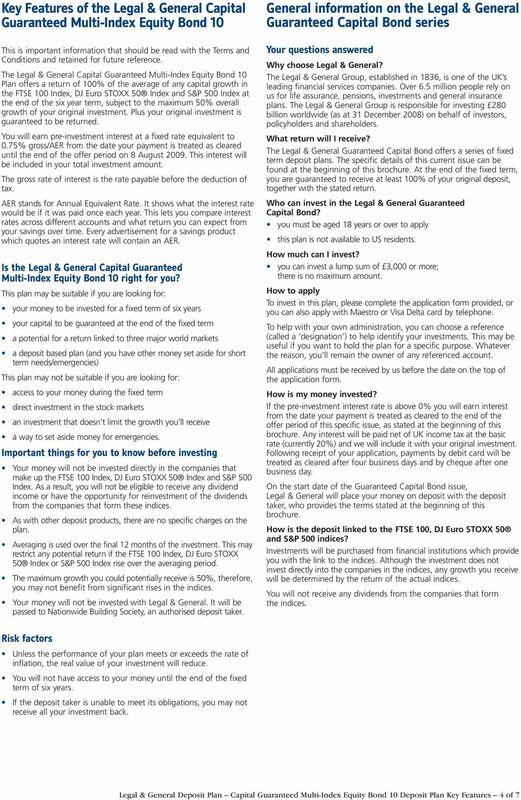 Your capital is not guaranteed and you may get back less than you invested. 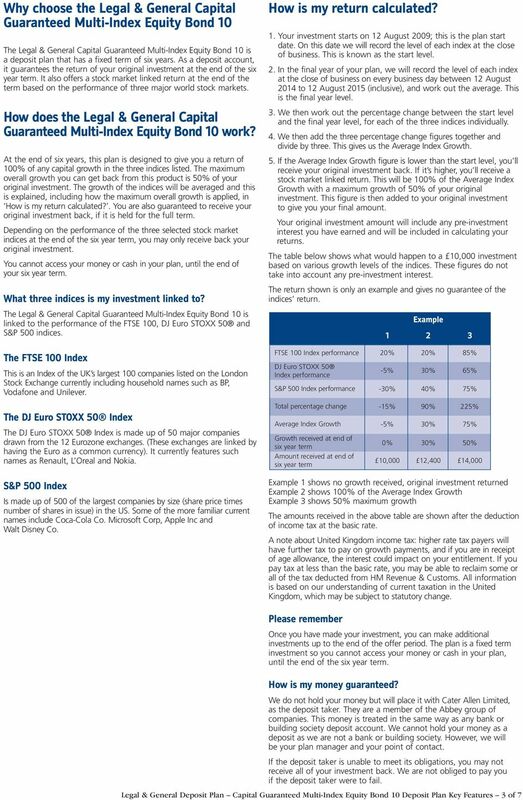 Key Features of the Funds Portfolio and ISA Funds Portfolio Global Investment Centre This is an important document. You need to read this before you invest in the Funds Portfolio and ISA Funds Portfolio. KEY FEATURES OF YOUR BUYOUT BOND ILLUSTRATION KEY FEATURES. and Conditions, available from your financial adviser. 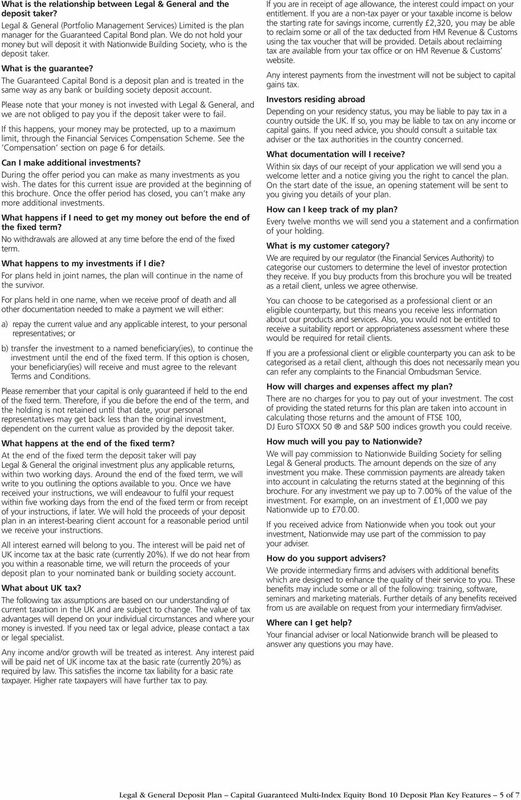 THREADNEEDLE NAVIGATOR INDIVIDUAL SAVINGS ACCOUNT (STOCKS AND SHARES COMPONENT) Terms and Conditions threadneedle.com Contents 1. Definitions... 1 2. Our agreement with you... 2 3. Eligibility... 2 4. 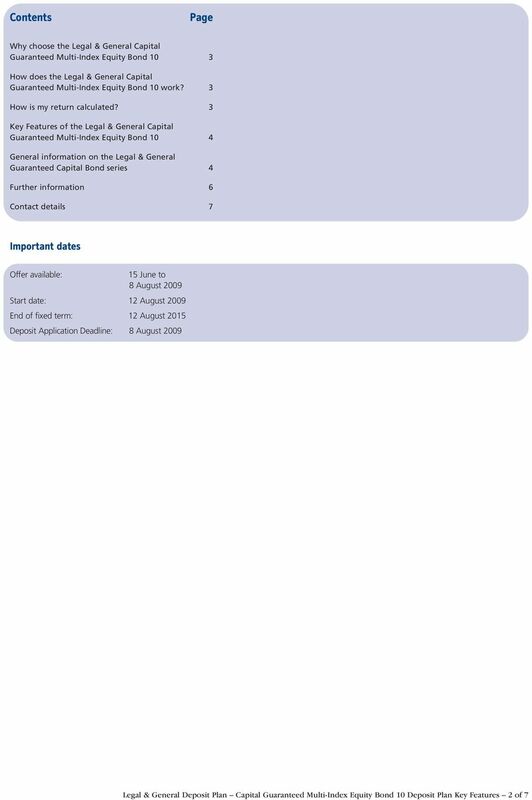 EQUITY STAKEHOLDER CHILD TRUST FUND. 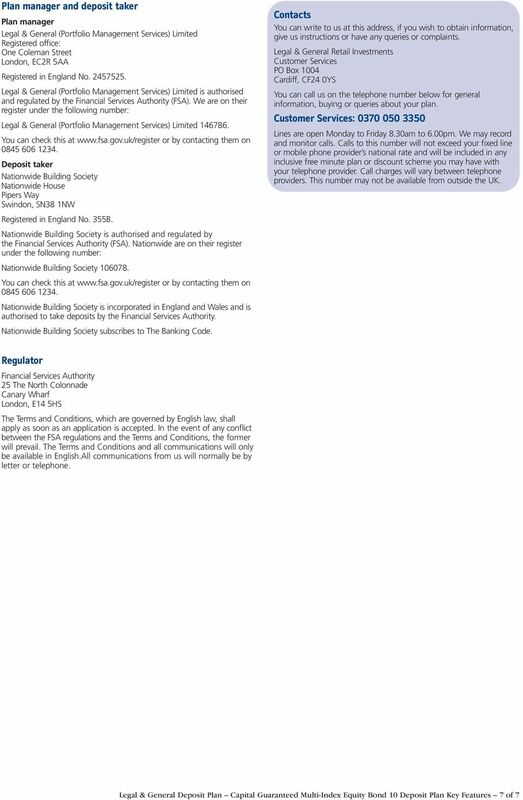 ST. JAMES S PLACE UNIT TRUST AND ISA SUPPLEMENTARY INFORMATION DOCUMENT PARTNERS IN MANAGING YOUR WEALTH This document sets out terms and conditions which summarise how we will manage your investment. EXCEPTED GROUP LIFE POLICY TERMS AND CONDITIONS.